The very best ideas in film are usually the most simple ones, executed beautifully. Using silence as a suspense device makes every tiny little sound terrifying and establishes an anxiety that sticks with you through the whole film. Best experienced in a full cinema, where everyone else is also holding their breath (and trying not to rustle their snacks or chew too loudly). 4 stars. 24 hours after seeing this my heart is still beating well above what is medically okay. A Quiet Place establishes the rules of its universe really nicely and adheres to them perfectly, delivering its thrills and tension from the first minute. 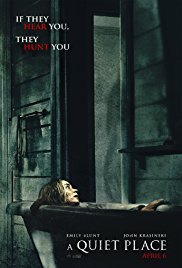 A terrific debut from Krasinski who delivers a horror film that consistently keeps you on your toes and is emotionally affecting in every way.